For most people, the kitchen is the center of family life. This is a place where everyone comes in the morning, starting his day, and where everyone gathers together in the evenings at dinner. However, not every family boasts a large kitchen. However, the fact that you do not have enough space does not mean that you cannot have excellent cuisine. Design of a small kitchen is a special art, but using our tips and recommendations, you can turn it into a comfortable and functional space, into a place where you want to return. Blue - color is bright and cheerful. It will look good in any kitchen. However, some consider blue too bold and overwhelming. 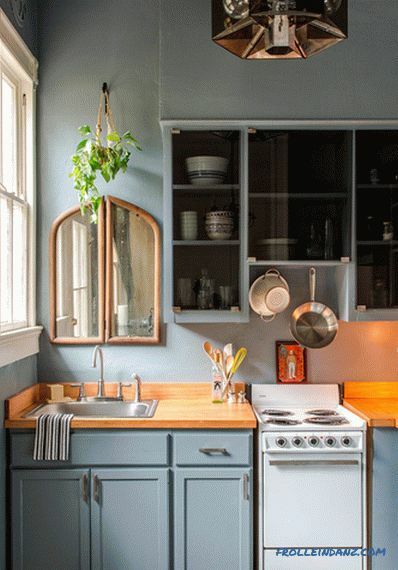 The owner of this modest kitchen created on it a bright, but at the same time restrained atmosphere with the help of muted blue tint on the walls and cabinets. An interesting design solution is a mirror above the sink. For most of us, a sink with a mirror is associated with a bathroom, but in the kitchen this element is very appropriate. 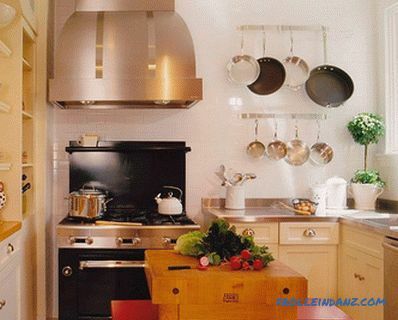 Moreover, in a small kitchen, a mirror can work wonders, visually expanding the space. 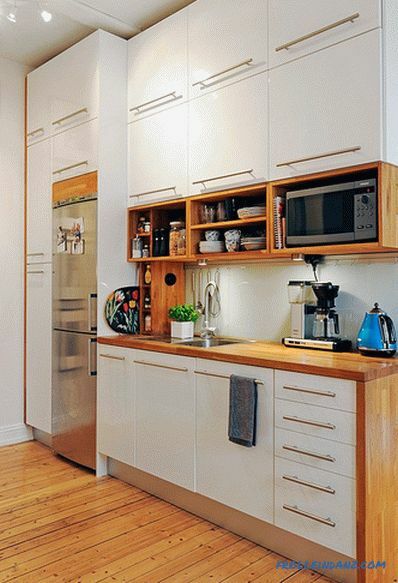 The transparent doors of the upper level cabinets also add some extra dimensions to this small but attractive space. 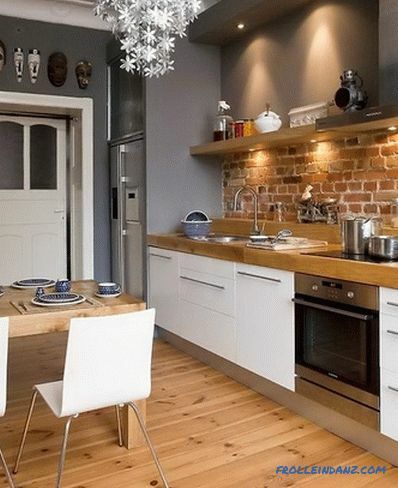 When it comes to decorating a small kitchen, do not feel limited by the old design methods. 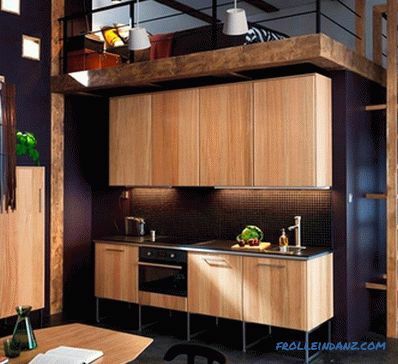 The layout of this kitchen is very unconventional - a narrow space, but at the same time very high ceilings. So that the architectural flaws did not seem so, the decor was used rather high by the owners of the kitchen. Decorative stickers on the wall and cute pendant lamps raise their eyes up, which allows you to focus your attention on the high ceiling, and not on a narrow space. The multi-colored kitchen apron brings a sensation of joy to this kitchen looking especially attractive against the background of white cabinets and walls. 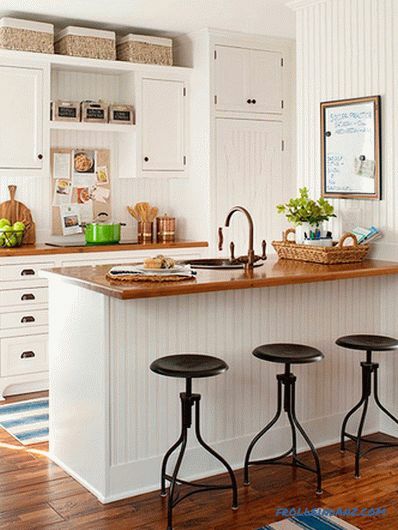 White cabinets and walls can be found in very many kitchens. For some, this may seem boring, but, it should be noted, it is quite practical. 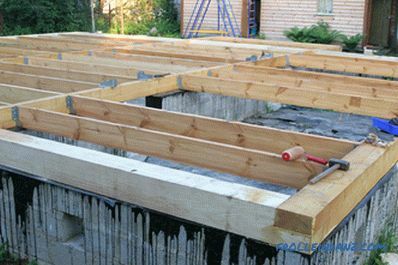 With this simple framework, you can create almost any decor scheme in your space. 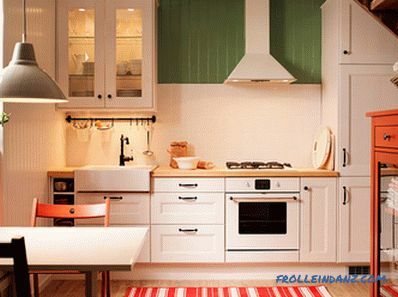 For example, in this kitchen emerald and cream are used as accent colors. An important role in this interior plays an antique chandelier, which gives the modern kitchen a touch of retro charm. 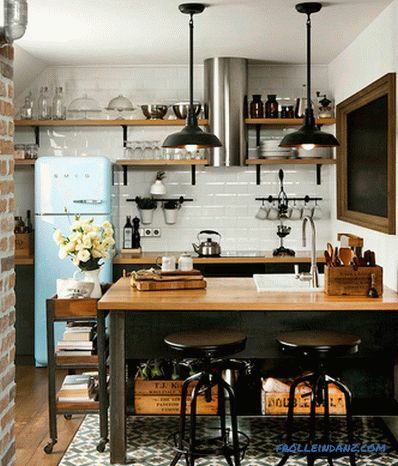 The combination of a light blue retro fridge with shiny black accents on this tiny kitchen is truly inspiring. 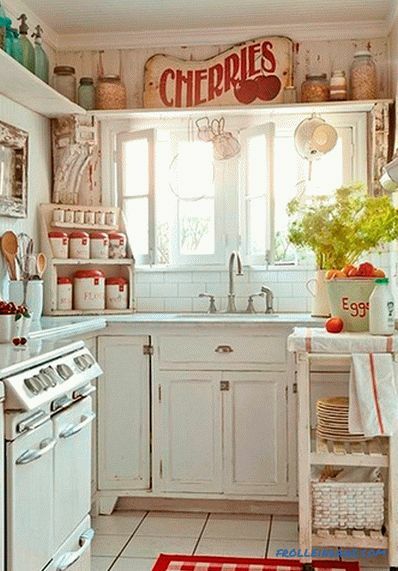 Bright white tile kitchen apron binds the whole picture together. The decor of this kitchen serves as a good example of how wonderful the interior can be if you don’t limit yourself to design ideas from just one era. The mixture of old and new creates a charming and quite modern look. Small accents, such as cream-colored flowers and antique wooden boxes, complete this truly magnificent picture. A few words should be said about the elegance of black and white decor. The tenants of this apartment have got an incredibly narrow kitchen, which does not have high ceilings, to at least somehow compensate for this shortcoming. Instead of redevelopment of the premises, the owners painted the ceiling and one wall black as a blackboard, adding a large drawing with an image of an ornate antique fork. A beautiful black French-style chandelier completes the very elegant look of the interior. This is an example of a kitchen design that could remain incredibly boring and dreary, but was animated by a few simple touches. Don't be surprised to see a lot of metal or other reflective surfaces when you get acquainted with other people's examples in search of design ideas small kitchen. Materials such as polished tin are great for small room spaces. First, they have a pleasant matte gloss. Secondly, and more importantly, they reflect the surrounding objects, creating the illusion of increasing space. That is why designers, trying to push the boundaries of a small room, use a lot of mirrors. 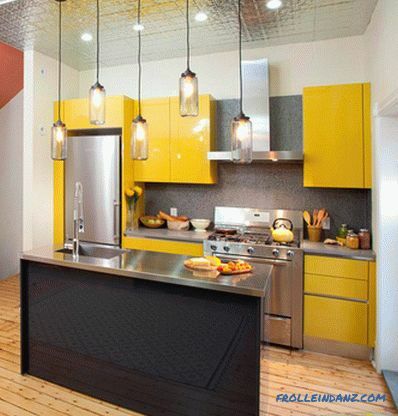 Reflective ceiling in this kitchen creates the feeling that the ceilings here are much higher than it actually is. 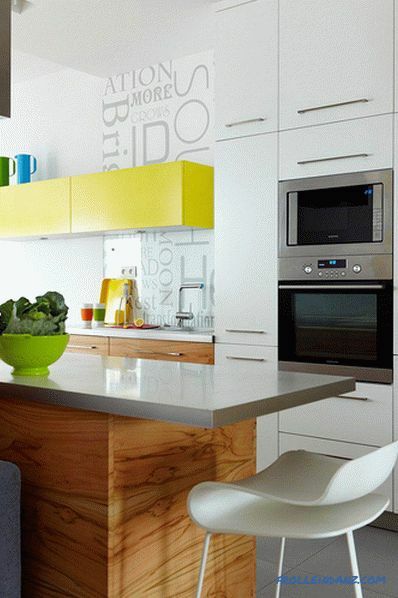 The bright yellow color of the cabinets also makes the space more open. Although some may decide that the presence of such a retro stove will be incompatible with their grand design plans, the owner This kitchen used it as an inspiration for interior design in a classic country house style. The soft cream tones of the walls and cabinets are the ideal backdrop for colored mugs, plates and bowls that perform both practical and decorative functions. The end result is a cozy and welcoming kitchen. 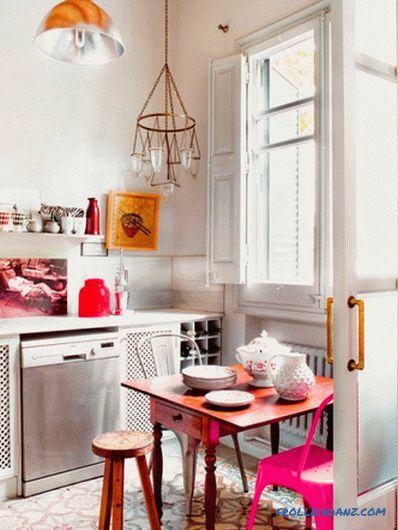 When choosing a color for a small kitchen, the average person is unlikely to call pink in the first place. Indeed, the kitchen, painted from floor to ceiling in pink, will give rise to unsuccessful associations with the bedroom of a teenage girl. 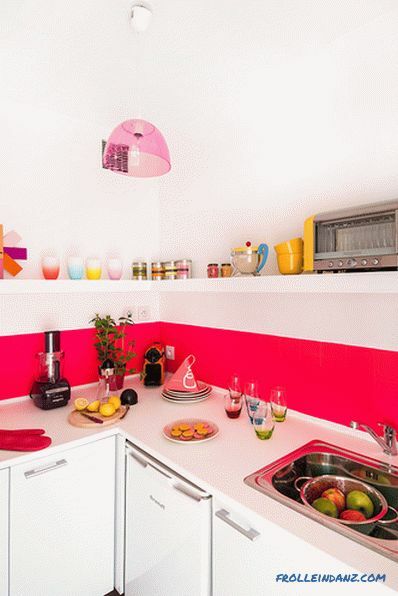 However, inflicting only one strip of pink on the white wall, the owner of this kitchen created a cheerful space that does not cause aesthetic rejection in representatives of both sexes and all ages. All sorts of colorful baubles, candles and decor items helped to enhance the created colorful mood. 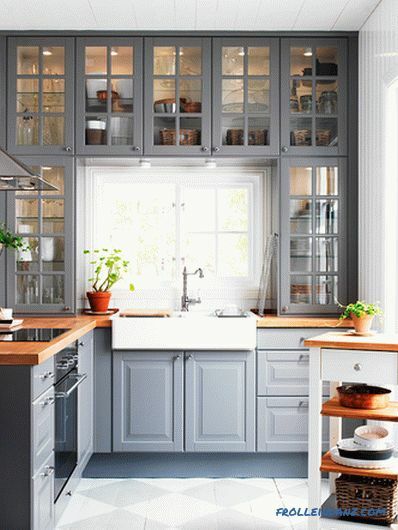 Walls and wardrobes painted from floor to ceiling in gray are not often seen in the kitchen, and yet in this interior gray looks quite appropriate. 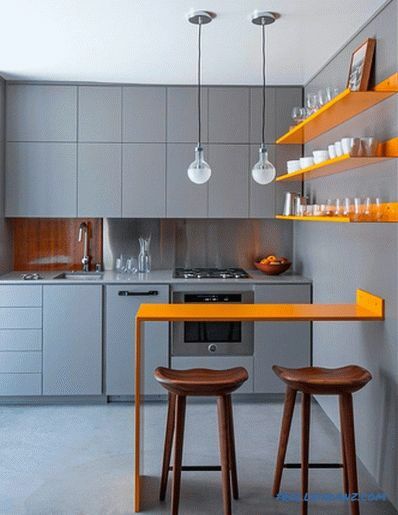 Of course, gray polished cement floor and the same color of the cabinets and walls themselves look harsh, cold and unattractive, but the owner of this kitchen managed to bring liveliness to the space with the help of bright yellow shelves and a bar counter. A lacquered wood kitchen apron adds texture to this elegant interior. Although for many such a design decision may seem too bold, there are those who will like it - these are people who want something sharp, urban and modern. 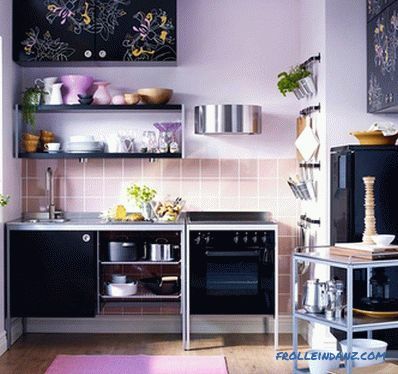 If you have a small kitchen, this does not mean that you have to compensate for this by using eye-catching colors and filling the space with lots of decorative trinkets. The owner of this house decided to keep the feeling of simplicity in his kitchen by connecting white cabinets with dark gray walls. This room is not crowded with decorative elements, but small accents are still present. All of them - and a miniature tree on the kitchen table, and photos in the frames on the next wall - give life to space. This example once again confirms that not all the interior design options for a small kitchen should be excessive or bright. Many people are afraid to use a white palette in their homes. They fear that the interior will look too bland, and the rooms seem to be unfinished. However, looking at this magnificent kitchen, you can be sure that the white color scheme can make the space bright, welcoming and very sophisticated. 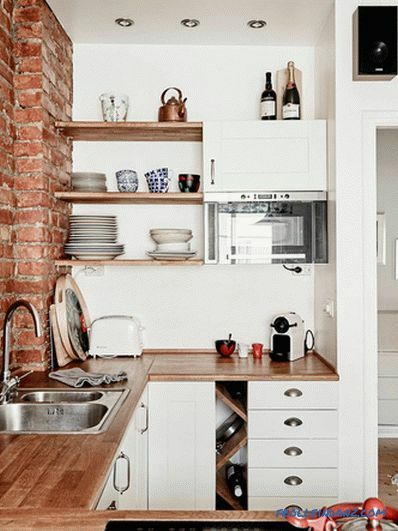 White walls and white furniture in this small kitchen are perfectly combined with natural wood floors. 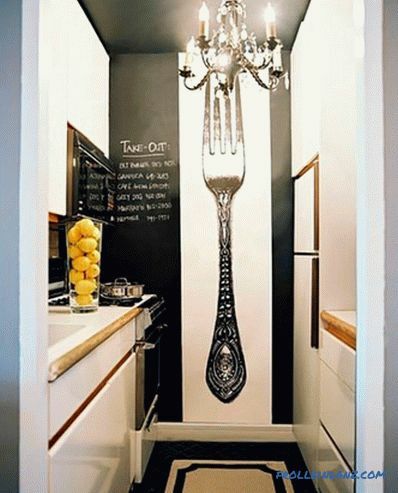 For many people, the idea of ​​painting even one wall in the kitchen black seems terrifying. For most of us, black walls are associated with dreary basements or sullen teenage rooms. Nevertheless, thanks to the rather bold use of a black accent wall, this kitchen looks quite elegant and modern. Polished metal countertops and a kitchen apron helped to avoid the dull look. Light colors of drawers, shelves and cabinets give space some brightness. This example is a demonstration that bold design decisions in the long run will surely pay off. If you prefer your kitchen to look not so much comfortable as modern, then this design scheme is perfect for you. 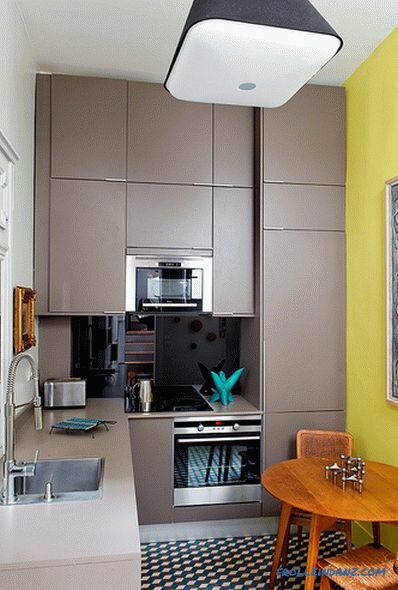 The owner of this house has chosen a gray-yellow color scheme for his kitchen, which gives the space a somewhat futuristic look. This sensation is enhanced by a geometric print, used both in the painting on the wall and in the rug on the floor. The unique pendant lamp, as well as the entire room as a whole, seems to come from the pages of a fantastic book. This design option is ideal for those who prefer a modern, cozy classic kitchen. Blue - calm and relaxing - a great choice for the kitchen. In many examples of kitchen design that you met today, various shades of blue were used to give an element of peace to space. The owner of this kitchen combined light blue walls with polished silver surfaces of cabinets and kitchen appliances to create an incredibly calm and welcoming atmosphere.Small accents, such as dragonfly and various decor items, strategically located throughout the kitchen, create an atmosphere of home comfort and hospitality. Take an example from the person engaged in the design of this room, and pick up artwork in the same color scheme as the space as a whole, to create a complete look of the interior. This homeowner, despite the fact that he was forced to work with a very limited area of ​​space, turned his modest cuisine in a serene place of solitude from the daily hustle and bustle. To create a concise, finished look, he connected simple white cabinets with worktops and shelves of natural wood. As a result, the interior turned out gorgeous and incredibly functional. Built-in lights generate the ideal amount of light for work and leisure. The combination of artificial and natural materials makes the interior look both modern and classic at the same time. Sometimes the combination of seemingly incompatible colors is the best strategy for interior decoration. The owner of this house got a kitchen with lilac walls and dark cream apron tiles. 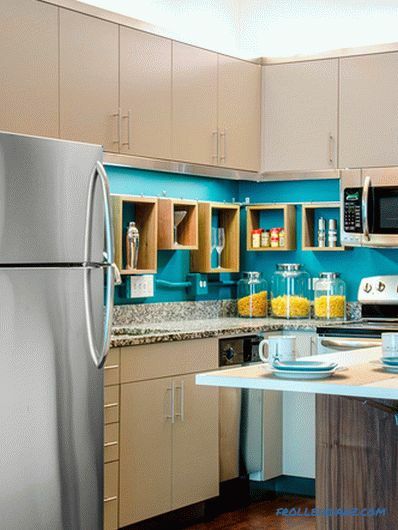 The expected choice would be the placement of silver or white cabinets and household appliances. He went the other way - introduced into the interior black. As a result, the kitchen acquired a soft and feminine, but, nevertheless, a very modern look. This kitchen is amazing when filled with natural sunlight, so the heavy curtains on the window here would be completely superfluous. Mobile trolley is ideal for a small kitchen - you can press it against the wall or roll it to the center of the room as needed. This small kitchen corner would be too boring and tasteless if it were not for the designer of its designer. 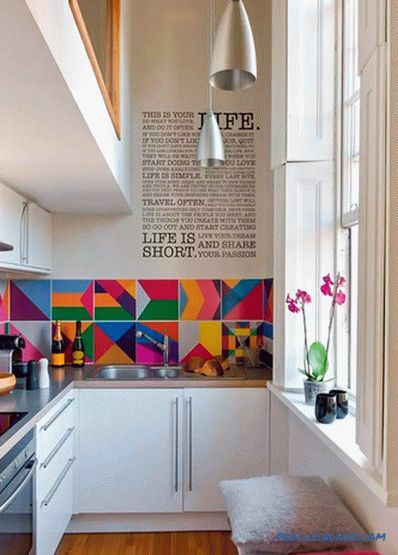 Having pasted a small section of the wall with wallpaper with a bright multi-color print, he was able to impart some amazing personality to this tiny space. On the rug, too, there is an interesting pattern, but in black and white colors, so as not to distract attention from the accent wall. Illumination of the lower part of the wall cabinet, however, as well as ceiling lamps, create a stunning glow in this mostly white space. Hanging on the railing all kinds of kitchen utensils, on the one hand, is quite functional, on the other - is part of the decor. Gray can be a difficult color for designers. If everything is done correctly, he is able to give the interior a very stylish and modern look. Otherwise, however, that is, when the designer made a mistake, the room would appear cold and uncomfortable. The owner of this kitchen clearly wanted to decorate the interior in the style of a country house, and in this case dark gray cabinets can hardly be considered an obvious choice. Nevertheless, thanks to the lighting of the cabinets and the abundance of natural sunlight, this kitchen has become bright, spacious and cozy. Gray actually adds a bit of color and individuality to the interior, which otherwise would be too simple and uncomplicated. A black and white color scheme may seem like an unexpected choice for the kitchen, but it's really a pleasure to work with. The designer of this interior chose white for the upper level cabinets and dark gray for the lower cabinets. On the kitchen apron is an exciting black and white drawing that perfectly catches the eye. In many modern black and white interiors, as a rule, small colorful accents are used to compensate for the simplicity of design. In this case, the light yellow chairs located next to the dining table are perfectly contrasted with black, white and gray. The design of this kitchen cost it its owner, probably not too expensive, but completely transformed the boring interior. A kitchen apron with an incredibly bold blue color helped bring life to the initially rather unpretentious kitchen. Just by changing the color of the kitchen apron, you can actually completely change the look of the space without making expensive and time-consuming repairs. 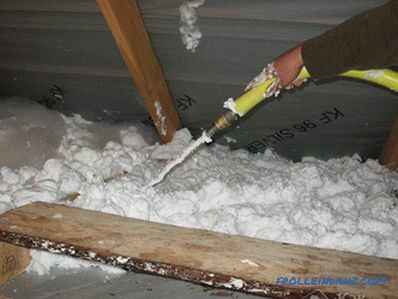 It is also an excellent choice for tenants, as it can be done fairly quickly, even before entering a rented apartment. We also draw your attention to the open drawers used here: they are not only functional, but also have a decorative function - they allow you to turn kitchen utensils into attractive decorations. Working with a wide range of colors helps to enliven any room.The designer of this interior painted the base of the central island table red to create a magnificent focal point in this kitchen. Wall painted from floor to ceiling in a variety of colors, also adds a lot of life and joy to space. Thanks to such multi-color of one of the elements, there was a great freedom in choosing the scenery for shelves and table tops. Take a cue from this homeowner and save the white or any other neutral wall color if you plan to decorate the interior with many bright colors and textures. In recent years, homeowners are increasingly reluctant to chic chebbi in favor of modern minimalist look. This kitchen is full of sunshine and delectable comfort, but at the same time it looks modern and very refined. The brushed metal surface of the cabinets gives the kitchen a stylish look, and an abundance of greenery and huge windows from floor to ceiling ensure that the space will appear bright and attractive. 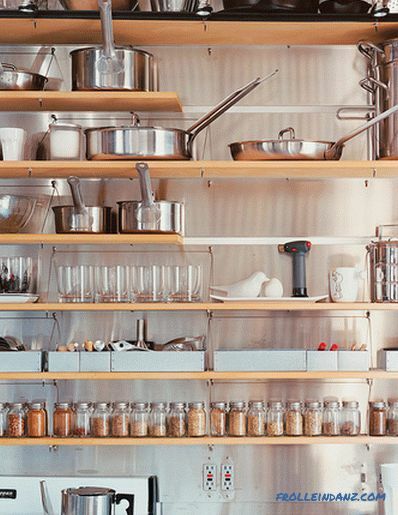 Please note that the decorative jars with spices in this kitchen are stored on the open shelves, and not hidden somewhere in the depth of the cabinets - such a design move can be reproduced by anyone. To create an attractive interior, modern architecture and fashionable design accents are completely optional. There is nothing wrong with sticking to a classic, feminine design scheme. 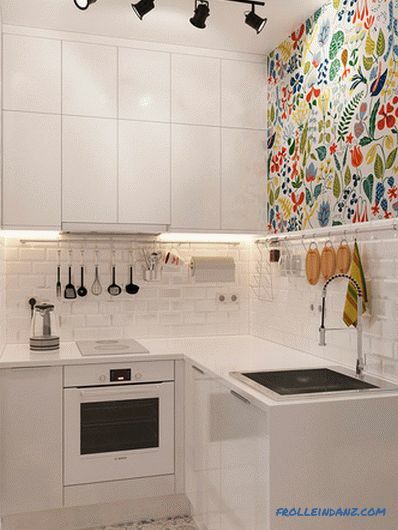 The owner of this kitchen has focused on the wall, decorated with cute green wallpaper with floral print. It blends perfectly with the rest of the space - simple but bright white. A folding table on the wall is a great idea for those who simply do not have enough space to accommodate an ordinary dining table in the kitchen. 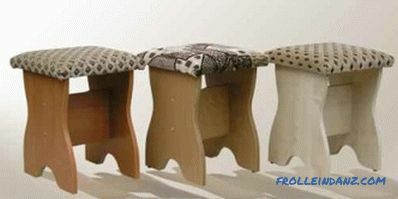 Stools, on the other hand, can be stored in a nearby pantry and taken out as needed. This is a great example of using a small space without overflowing it with furniture. After reading a sufficiently large number of kitchen design examples, you will certainly notice that in most cases it is selected one element that will serve as the focal point of space. In some cases it is an accent wall, in others - an island kitchen table. 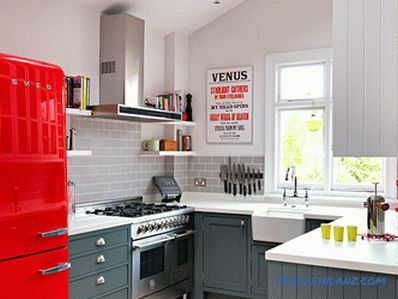 This unique kitchen serves as a coordinator for a cherry-red refrigerator. The creator of this interior had the quick wit to keep muted shades in the rest of the kitchen - dark gray cabinets are not able to withstand a bright fridge. The red text on the poster next to the window serves as an excellent accent that binds the entire decor scheme together. In many kitchen design examples that we have seen, the wall is intentionally accented. However, in some houses and apartments such a wall exists initially - a brick wall, not covered with a thick layer of plaster and other finishing materials. Instead of hiding the brick, you can try to work with what is. The white color scheme of the room and countertops made of natural wood in this kitchen perfectly complement the rustic rustic look of bare bricks. 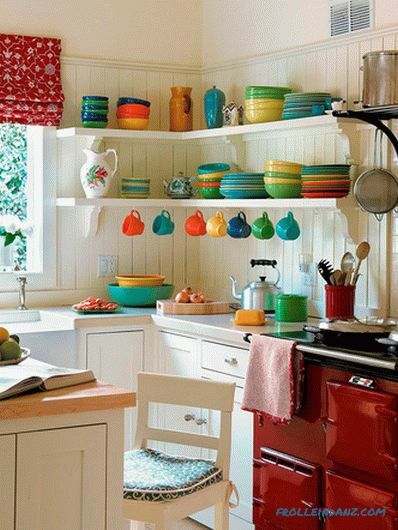 Built-in shelves allow an excellent collection of teapots and accessories to be in the most prominent place. As we have said, many of the truly magnificent kitchen interiors have an object that is sure to catch the eye. 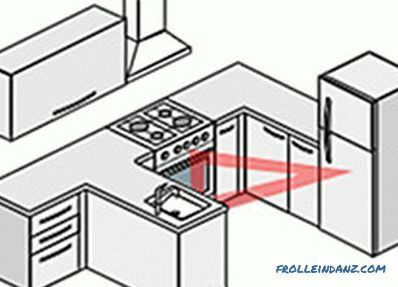 In this example, it is a cupboard with lights, located above the sink. This is the perfect way to showcase your china, beautiful dishes or tea sets. Such cabinets will look harmoniously in almost any kitchen. For example, here the wardrobe fits perfectly into a modern interior with hints of country style. The contrast of the olive-green walls and the light ivory kitchen apron creates a very elegant look, and the checkered curtain makes the atmosphere of the room even more cozy. In order to work with unique shapes and patterns, a special courage is required of the designer. 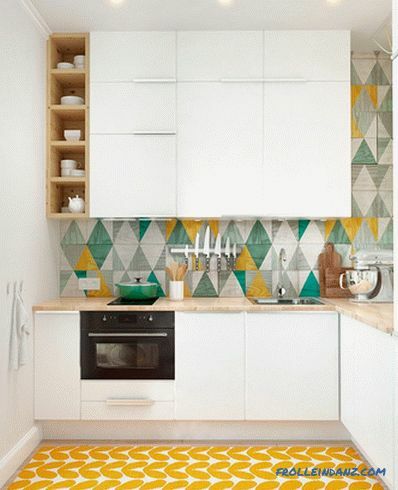 The multi-colored triangles on the walls of this kitchen could easily “overplay” the interior. 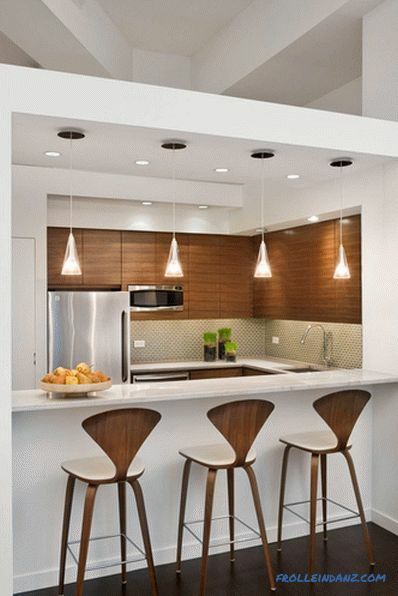 However, retaining the simple look of cabinets and countertops, the owner of the house created a bright and modern, but not overwhelming design. A carpet that has a similar, but still not a matching pattern perfectly complements the wallpaper. I must say that such wallpaper may seem frightening to many, but if done correctly, the end result will be truly stunning. 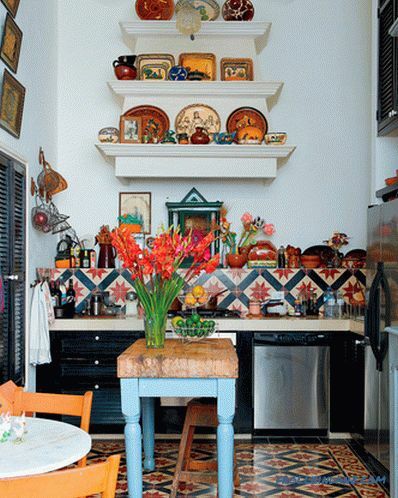 The owner of this kitchen must have been inspired by the magnificent old buildings of Mexico City. As a result, the interior turned out bright and cheerful. 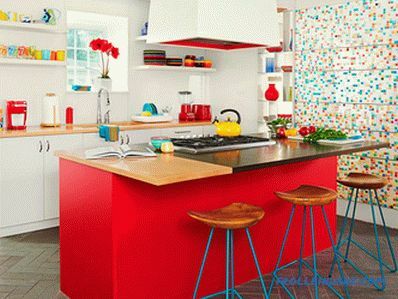 Pale blue table legs and a wardrobe are surprisingly complemented by bright pink, red and orange kitchen apron tiles and various decorative elements. Used decoration technique creates the illusion of increasing space. A pyramidal rack filled with beautiful antique features instantly makes this kitchen visually twice as large as it actually is. 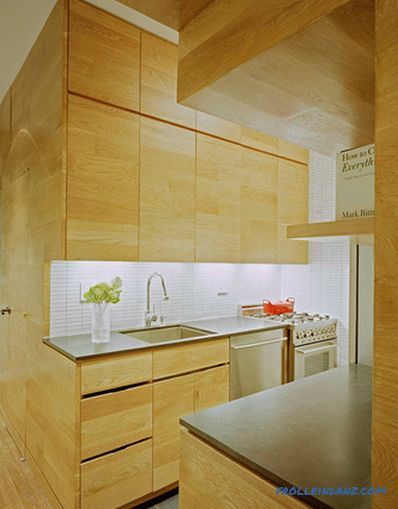 The art object is able to "make" or "break" space and kitchens are no exception to this rule. The design of this kitchen can be called relatively simple. Nevertheless, there is a great focal point here - a large, floor-to-ceiling art object with text. There is not so much free space in the kitchen, but we still managed to find strategic places for the decor. 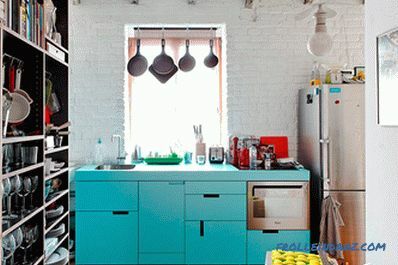 Take a look at this kitchen, and you will realize that life can be brought into any space, regardless of its size. It is only necessary that you be creative enough. The indiscriminate "throwing in a bunch" of different objects of the decor can be very dangerous. Although the finished product may turn out to be eclectic, which you seemed to be striving for, you run the risk of tastelessness. The owner of this kitchen managed to achieve a harmonious look. Two pendant lights are completely different, but they fit well together. Two completely different chairs and a stool have gathered around the dinner table, but the whole motley "company" looks quite harmonious. If you're a fan of eclecticism, get inspired by this fancy design. No one will ever blame the developers of the design of this interior that the kitchen they created was rustic and too homely. This stunning modern design is bold, gorgeous and completely futuristic. The shiny black cabinets serve as a kind of accent wall that contrasts beautifully with dazzling white surroundings. The focal point of the space, without a doubt, is a lamp with frosted glass, also made in a futuristic style. Highlighting the bar counter creates an elegant glow of the entire space. The owner of this kitchen acted very wisely: he did not place any works of art or decorative objects here, allowing instead to get aesthetic pleasure from architecture and design, which speak for themselves. In our collection, this is perhaps one of the most pleasant to the eye examples of decorating the interior of a small kitchen. Although the kitchen itself is really small, the abundance of natural light and the many shades of natural wood give it an open and attractive appearance. The soft cream color of the built-in wardrobes and shelves blends perfectly with perfectly white walls. Metal countertops help to further expand the space, as the sunlight pouring out of the window, perfectly reflected from their mirror surfaces. Although this design seems simple enough, it looks amazing. 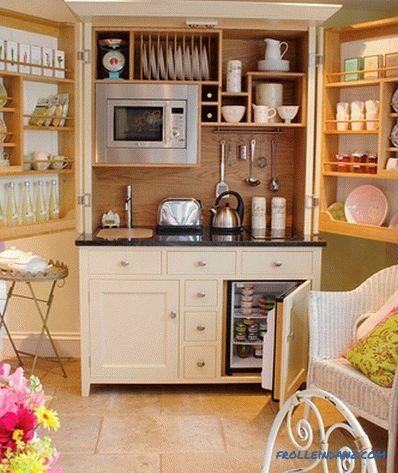 It is unlikely that anyone could arrange a tiny space better than the owner of this mini-kitchen. He had the idea to place in a large, floor-to-ceiling wardrobe a whole kitchen rack, including a sink, microwave and many shelves. It should be noted that the wardrobe looks beautiful, both open and closed. This kitchen corner is fully functional and fits well with the interior of the rest of the house, decorated in the style of chebbi chic. For a kitchen with a very limited space, such a design solution can be considered ideal, especially if there is a functioning bar in the living room. Some designers who are fighting for the purity of the style will indignantly groan and gasp at the thought of using bookshelves in the kitchen instead of cabinets, but those who like the modern style of interiors, immediately recognize this bold design step. For many residents of city apartments, bookshelves may be the only available place to store plates, dishes and kitchen utensils. The use of shelves can be considered one of the most reasonable solutions in a limited space and with a limited budget, as long as the final result is attractive. 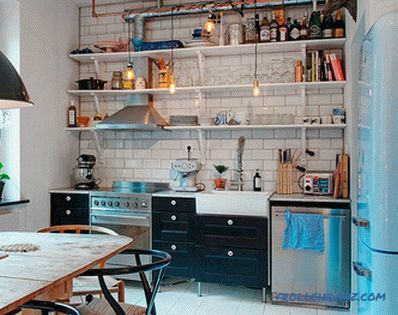 If you are looking for ideas for a budget design for a small kitchen, you can stop your search.Consider that you have already found what you need - take a look at this amazing tiny space. Although its owner did not replace the existing furniture and lamps, he managed to breathe life into this small kitchen. But he merely installed two elegant black shelves over the table top and placed delicious dishes on them. In addition, the homeowner knew that living plants would help to decorate the space, so he hung small pots with potted flowers on the silver railings placed near the sunny window. The embodiment of these small design ideas in life is not worth a fortune, but can completely modify any space. The decision of the homeowner to work with such complex materials led to the fact that this small kitchen looks like a million dollars. 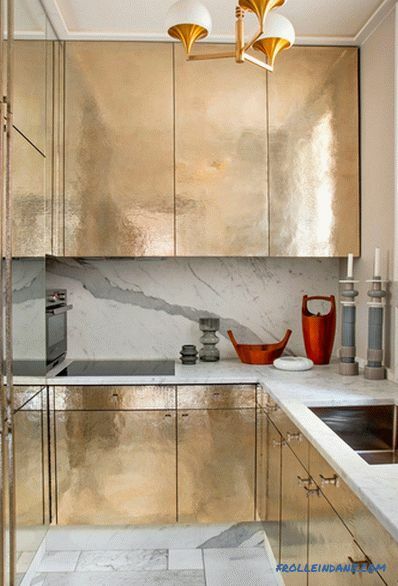 Gold cabinets create an atmosphere of sophistication, and their reflective surfaces give the illusion of increasing space. The marble pattern on the kitchen apron also adds refinement to the interior of this small but stunning kitchen. 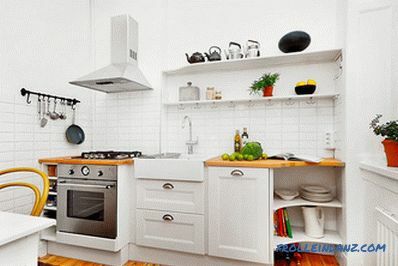 When you are looking for interior design ideas for a small kitchen, do not feel that limited space hinders your choice. When you get acquainted with the various kitchen design ideas of a small area, you can hardly find many "mysterious" options. This word is best used to describe the innovative design of the kitchen represented in this example. 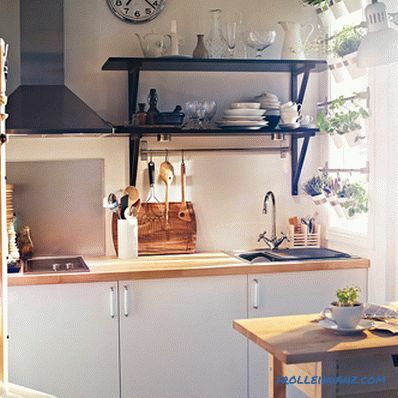 This small kitchen corner is part of an open-space attic space, and creating an idea for the design of which for most of us is an impossible task. However, the designers of this interior, thanks to the use of light wood for the manufacture of cabinets, managed to create a zone that stands out without conflict with the rest of the very dark attic space. 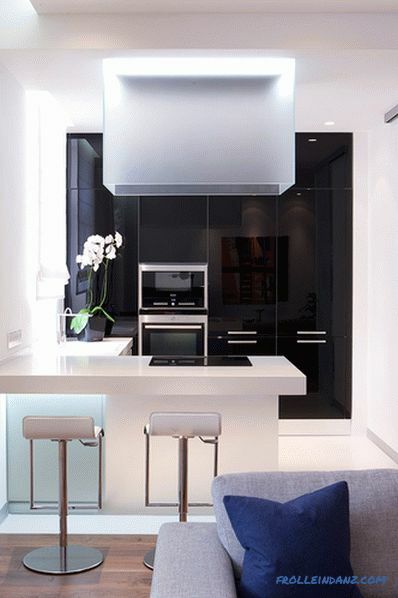 This magnificent kitchen creates an element of softness in a very dramatic space. 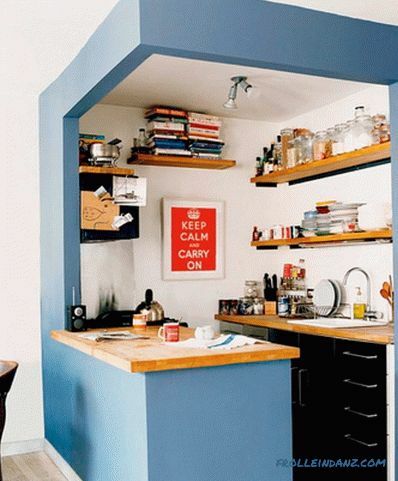 In professional kitchens, under-ceiling storage is a necessity and even the norm. This homeowner took an example from professionals and installed in his kitchen a few simple hanging rods that can be used to store all the necessary. Hanging baskets serve as an excellent and functional place to store fruit, and pots and pans are also easily hung here. Such a simple device is ideal for those who work in a limited kitchen space. It is not only incredibly comfortable, but also allows with minimal effort to give the kitchen a finished modern look. Even if you cook a lot and “fly” around the kitchen like a bird, do not feel confined to a small space. 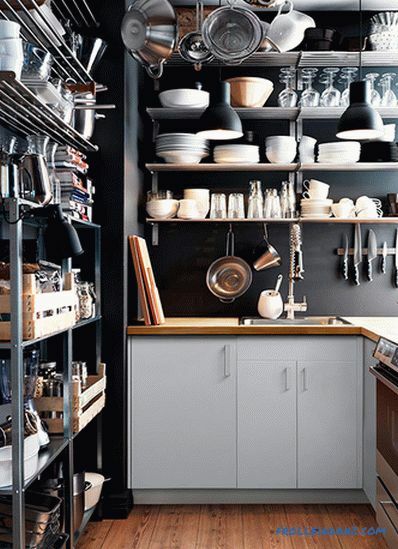 By installing an open rack and railing for hanging dishes, the owner of this kitchen can store a lot of everything needed in a relatively small area. If things are kept neat and orderly, the space never seems cluttered. 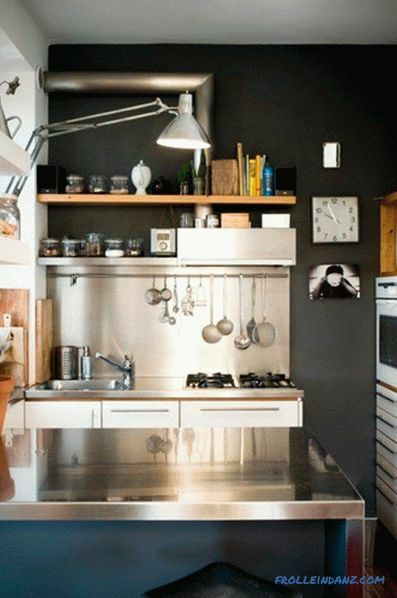 A dark gray, almost black wardrobe goes well with silver worktops and a kitchen apron. Such truly impressive cuisine can be seen in fashionable restaurants. 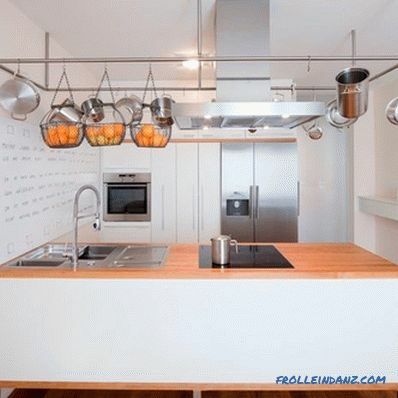 In such a functional kitchen, professional and novice chefs will feel at home. The original look of this kitchen might have seemed like a nightmare to many. Having crossed the threshold of this room for the first time, residents of the house discovered naked exhaust ventilation and shelves instead of cabinets. 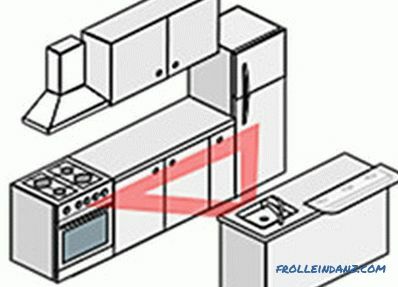 They did not start a big repair in an attempt to hide these flaws, and used them in the design of their tiny kitchen. Shelves were decorated with dishes, books and various trinkets to give the space some personality. Instead of trying to “hide” the ventilation pipe, elegant lamps were hung on it. As a result of these simple transformations, the kitchen acquired an incredibly modern urban look. 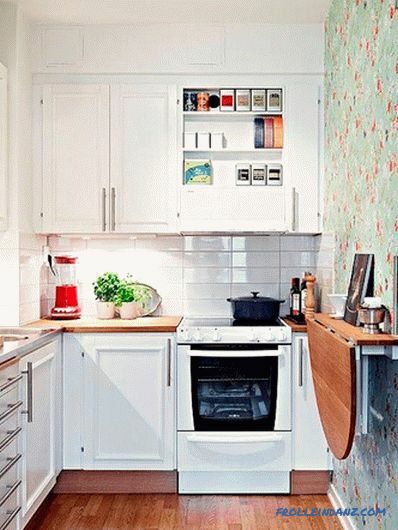 Your tiny kitchen doesn't have to have an accent wall or a bright design. Take a cue from this homeowner and keep your kitchen simple and orderly. The space here is small, but the combination of white walls and painted wooden cabinets creates a feeling of brightness and openness. Magnificent lamps above the bar stand serve as an ideal space coordinator. The owner of this kitchen did not use here countless items of decor, diversifying a simple interior with only three green plants and a bowl for fruits. The creators of this beautiful kitchen corner drew inspiration from the calm style of Japanese architecture.The atmosphere of this space evokes memories of beautiful interiors that can be seen in modern boutique hotels in Tokyo. Wooden cabinets, floors and walls give a feeling of calm and serenity. Built-in lighting in the cabinets creates a light, almost unearthly glow. If you want to recreate this Zen atmosphere, take an example from the owner of this house and keep the number of decorations used to a minimum. A simple vase with flowers is really all that is needed in this interior, and this is quite enough not to spoil the created feeling of calm. 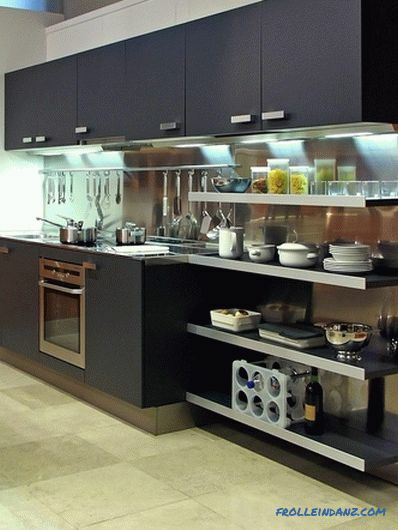 Futuristic Design - Organization of Space The kitchen design scheme is perfect for you. 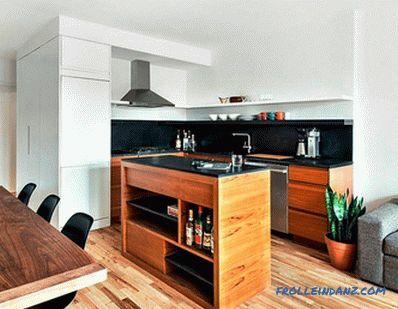 This kitchen uses hidden space - a similar solution is very popular in major Asian cities, such as Seoul or Tokyo, where apartment areas are very limited. Everything in this interior looks modern - from polished metal surfaces to hanging golden spherical lamps. This design idea is suitable for any occupant of a private or rented apartment who wants to turn a small kitchen space into something more. 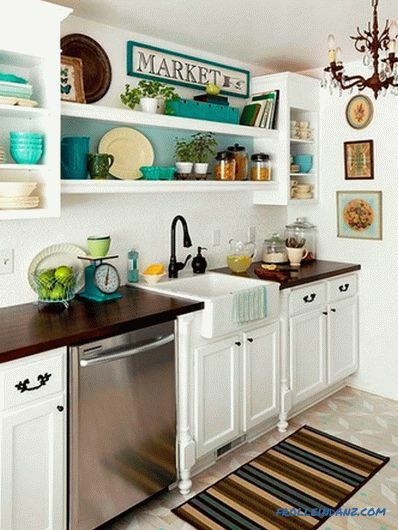 The creators of this tiny kitchen drew inspiration from the classic interiors of the 1950s. The cabinets are painted in the light-emerald green color widespread then, instead of a large modern stove, there is a rather tiny gas oven of a rather old model; Obviously, the owner of this kitchen tried to give it a retro look! 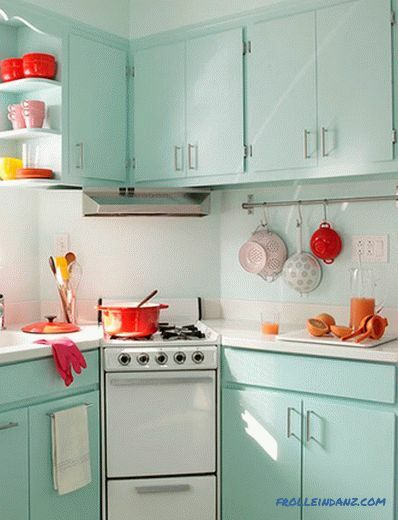 Such a retro interior for some may seem quite bold, but the classic style of the kitchens of the 1950s is a piece of America that will be popular for a long time. This small kitchen is a vivid example of how the choice of the method of interior design depends on the existing architecture. 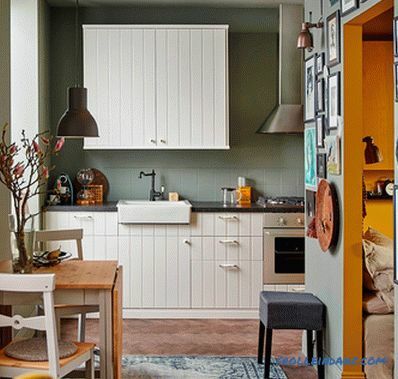 Perhaps many would be confused when deciding what to do with this small cubist kitchenette, but the owner of this house found a solution and at the same time managed to make the interior light, airy and neutral in terms of the color used. The unique architecture of the result does not look too modern or futuristic. Small accent touches, such as books, artwork and vintage spice jars, give this kitchen a beautiful, welcoming look. While modern and stylish design tends to dominate among the most popular, all of us at least sometimes deep down inside want something something cozy. In this tiny kitchen original furniture and retro stove - the designer is clearly a country style. The space is decorated with simple knick-knacks and a classic red-and-white check mat. As a result, the kitchen has acquired a soft, cozy and feminine look. Modern design, of course, looks exciting, but such simple, classic, rustic-style kitchens still attract our attention. This kitchen is clearly designed for a very busy family. Everything here is aimed at quickly and effectively meeting the needs of the tenants of the house (which only is a board hanging on the wall for important information and notes to each other). However, this functionality was achieved without sacrificing style. Walls and wardrobes retained their plain white color, but at the same time small accents such as striped blue floor mats bring a bit of color to the interior. Get inspired by this design (you can borrow the idea of ​​using a whiteboard to place on it a list of products you need to buy, or some reminders to your household). In this kitchen, you can find the embodiment of several design ideas, which we have already mentioned above. From natural wood flooring and an open brick wall to creative accents such as tribal masks above the door, this kitchen combines various elements without looking supersaturated. A snowflake chandelier might seem tasteless, but in combination with dark gray walls, wooden countertops and a floor, it looks quite stylish. This example demonstrates that with the right selection of colors and design elements you can really do anything. Designing a very small kitchen can be quite a challenge, but if done correctly, it will look great. 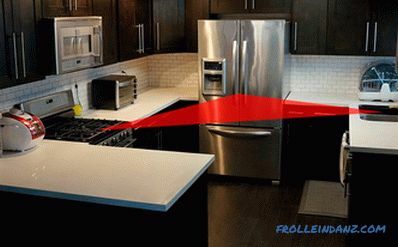 Take a look at this incredibly narrow kitchen and agree that this architectural flaw is almost not noticeable. Cabinets with glass doors, located above the sink, chained the eye to the upper part of the space, which makes the room seem larger than it really is. 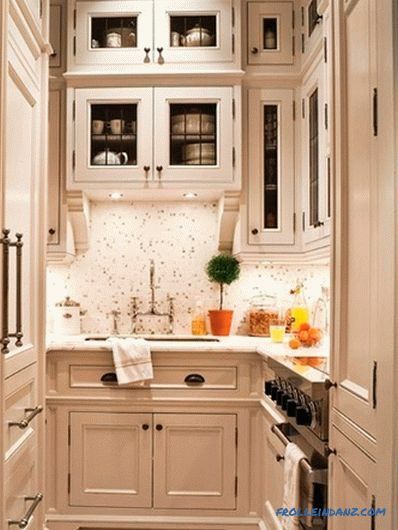 Beautiful large floor-to-ceiling cabinets of light cream color create a calm atmosphere, not without elegance. 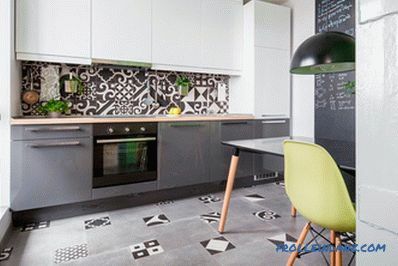 Colorful accents on the worktop add a bit of color to the interior, and beautiful black and white tile on the floor gives it individuality. In open-plan apartments, it is not easy to separate the kitchen area from the rest of the space. This corner kitchen could easily be “lost” in the interior. However, an elegant black apron and the same countertops visually separate the kitchen from the rest of the rather neutral space. 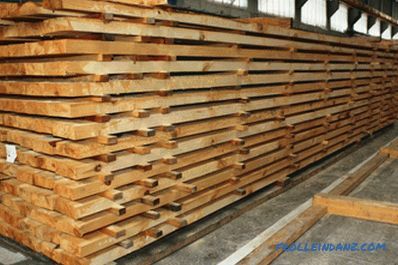 The wood from which the kitchen tables and pedestals are made has a darker shade than the floor, which also helps the kitchen to stand out while harmonizing perfectly with the rest of the space. 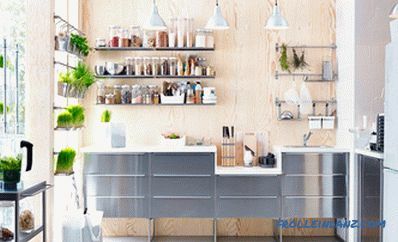 In conclusion, I would like to dwell on several important aspects that may affect your choice of ideas for designing a small kitchen in an apartment or a private house. 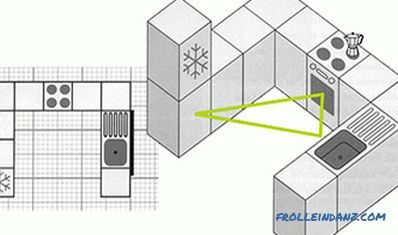 Try to maximally optimize the space available to you, focusing on the issues of functionality. Carefully review your project and decide where to place large kitchen equipment (refrigerator, stove, etc.). Meet the working triangle rule. This concept is more than 70 years old, but it is still widely used in the design world. This idea is quite simple, but it saves time and energy of a person engaged in cooking. 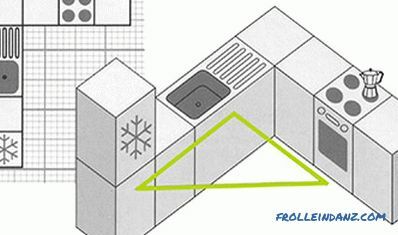 The work triangle connects the three main work areas in the kitchen: sink, stove and refrigerator. The distance between these points must be at least 1-1. 5 m and not more than 2. 5-2. 7 m. The sum of all three sides of the triangle should be from 4 to 8 m. Considering how highly effective the result is, it is definitely worth taking this rule into account when considering various kitchen projects. 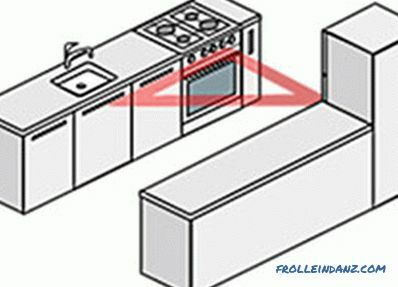 Think about an L-shaped or U-shaped arrangement of furniture with a large island or peninsular table in the center. These forms provide many cabinets and worktops and easy access to them. To the island table, you can attach a bar, where you can eat. When planning your space, do not forget about storage space. In the kitchen, as a rule, there are a lot of dishes, pots, pans and various kitchen utensils, and you need to have enough space to store all this within easy reach. 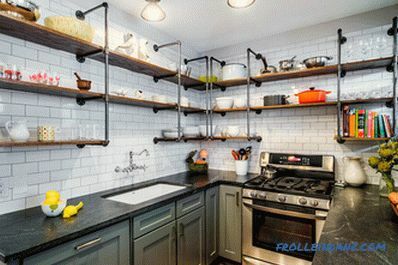 Since the horizontal space in a small kitchen is limited, think about the vertical: install various racks, racks and shelves that stretch high along the walls. 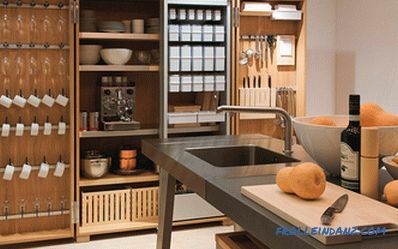 Try to find innovative containers and multifunctional storage spaces. 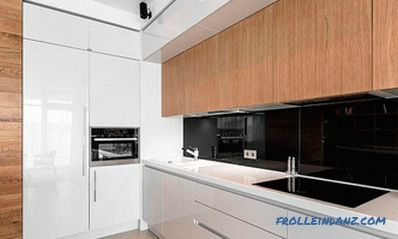 Since a large area of ​​your kitchen can not boast, let it benefit from the use of finishing materials interesting. Granite and marble countertops are a more elegant option, although concrete, limestone and stainless steel are in fashion today. Frosted cabinets are great for modern design, and cheaper painted ones are for country. If you decide not to use a lot of color in the design of your small kitchen, try to make a bright mosaic apron or a bright floor covering. Remember that reflective materials, such as mirrors, can create the illusion of increased space. Remember that your kitchen should reflect your personality. The ultimate goal of yours should be to create not only a functional, but also a beautiful space where you can eat and relax. 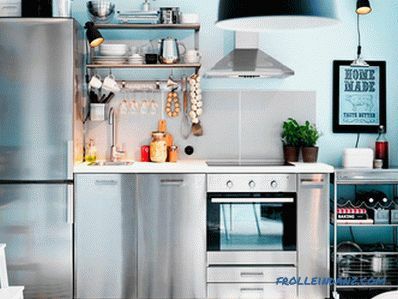 Turn a small kitchen into something more by implementing one of the projects presented here. When it comes to interior design of the kitchen, many people perceive the small space they have at their disposal as a death sentence. However, as you could see, having familiarized with the fifty interiors presented here, this is not so at all. A small kitchen does not mean that your design ideas cannot be big. Regardless of whether you prefer country-style or you prefer something elegant, chic and modern, you can create the desired image in a small space. Let your personality and designer taste manifest. Even a very small kitchen can be filled with life.